YOSEMITE! We woke up early from our delightful “rustic retreat” called the Yosemite Bug! Grabbed a cup of coffee and headed out the door. We stumbled upon a closed “welcome center” and decided to look at the map on their wall outside just to make sure we were headed in the right direction. We noticed a car in the parking lot. And a woman got out and said, Can I help answer any questions? I work here all summer as the hostess and am waiting on some friends. Her name was Tracy. 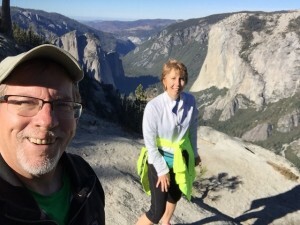 Well, don’t you know, we started a conversation and she suggested we drive into the park and go straight up towards Glacier Point and at the trailhead, hike around the loop towards Sentinel Dome. She said it would be about five miles. So, that’s what we did. 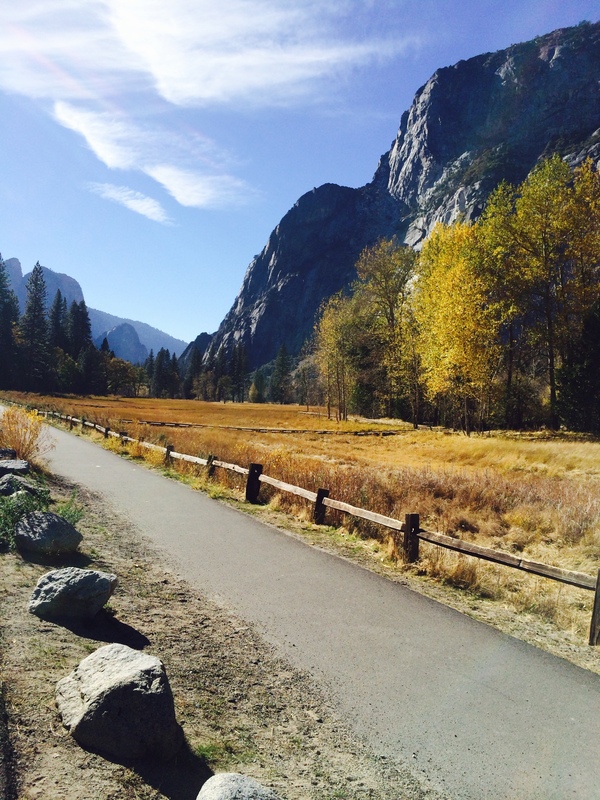 As we entered Yosemite National Park (the first park in the national parks systems which was established in 1890) before 8:00am, the early morning sunlight was glorious on the mountainsides. We drove up to the trail head near Glacier Pt, stopping for a few pictures along the way. WHAT A GLORIOUS HIKE. The majestic trees soared over us and the views were absolutely stunning. We didn’t see another human being until we had hiked about three miles. It was just the two of us and some of God’s amazing scenery and critters! The overlooks were fabulous and the hike up to the Sentinel Dome – though tiring (okay strenuous) – the 360º view was spectacular. We looked down on El Capitan and Half Dome as well as other glorious mountains and cliffs. We are so grateful for the serendipity of meeting Tracy this morning and having her suggest this hike. After we finished the hike, we headed to the Canyon floor for a picnic and then to the welcome center to learn a bit more about the history of the park. After we left Yosemite National Park, we showered and went to ‘dine’ at the Yosemite Bug’s diner… As we were waiting for our food to arrive, guess who walked in with several of her friends? It was Tracy, the woman who had helped us this morning. We were delighted to be able to thank her for her suggestions. Also during dinner, we met a nice couple – Melissa was from Canada and her partner, from Poland. They are in grad school at Princeton and she attends Nassau Presbyterian Church. What are the odds? Another great day on our California Adventure!